We teamed up with Buzzfeed to create some incredibly indulgent, simple, mouth watering recipes. Learn how to create our ULTIMATE homemade popcorn honeycomb, and hot chocolate meringues. Line your tin with non-stick baking paper and grease the paper with butter. Scatter half the popcorn over the tray. You can use a metal tin, but using silicone ensures the honeycomb stops cooking as soon as you pour it in. Mix the caster sugar and golden syrup in a deep saucepan (without allowing to bubble) over a medium heat. Once all of the sugar has dissolved, turn up the heat and simmer until the caramel resembles the colour of a copper penny. Take the pan off the heat and immediately add the bicarbonate of soda. Beat with a wooden spoon to fully incorporate it until the mixture is foaming. Scrape straight into the prepared tin –be careful as the mixture will be extremely hot. Leave to harden at room temperature for about 1½ hours, then smash the honeycomb into pieces. 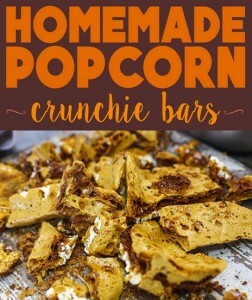 Half-dip your smashed honeycomb pieces into your melted dark chocolate and scatter with the remaining salted popcorn. Leave to set, then devour. Take the sugar out the oven and turn the heat down to 100°C. With your mixer on full speed, very slowly spoon the hot sugar into the stiffly beaten egg whites, making sure the mixture comes back up to stiff peaks after each addition of sugar. Once you have added all the sugar, continue to whisk on full speed until you have a smooth, stiff, and glossy mixture. You should continue to whisk for at least 5 minutes once all the sugar has been incorporated. Feel a bit of the mixture between your fingers; if you can still feel the gritty sugar, keeping whisking at full speed until it has dissolved and the mixture is smooth, stiff, and glossy. Split your vanilla pod in half and scrape out the seeds, then gently fold them through the stiff meringue mixture. Preheat the oven to 100°C. Line a flat baking tray with baking paper. Draw circles on your baking paper, a third smaller than the rim of your coffee cups. 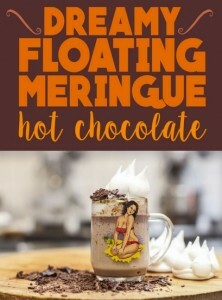 You want the final iceberg to float on the hot chocolate and fill the whole cup, and the meringue will expand during baking, so you need to allow for growth. Spoon the meringue into a disposable piping bag and cut a hole the size of a 5p coin in the tip of the bag. Pipe your icebergs on to the baking paper within the drawn circles – for each start with a big dome shape, then build up the iceberg with spikes. Bake for 2 hours, until they are set and lift off the baking paper cleanly. Store in a biscuit tin for up to two weeks, or until you are ready to set sail on your daydream. Put the milk and cream into a small heavy-based saucepan and bring to a gentle simmer over a low heat. Add the chocolate squares to your mugs, pour over the hot milk and cream and stir until the chocolate has completely melted. Top with your big white icebergs, and serve.